This was taken at Auchenharvie, it was after Pringles garage went on fire. 2nd top, ????,????,????,????,????,????,??? ?, Kay Cramb, ??? ?, Marion Bell, Theresa Beattie, Brian Shaw. Front row, William Barr, ??? ?, Robin Millar, Joey Hamilton, ??? ?, Charles Millar, ??? ?, ????. Last edited by Hughie on Fri May 18, 2018 11:22 pm, edited 1 time in total. Great photo Little Plumb. I knew Bryden McGuinness and Jean Cairns (Kilmory Road, Saltcoats) from time spent at Saltcoats Bathing Pool. Bryden's sister also swam there on a regular basis but I'm struggling to remember her first name. I also remember Bryden's dad - I have a clear vision of him but strangely can't remember from where. Did he work with British Rail? Someone might know? Alan should know him. Bryden dated my pal about the same time I dated Alan. Hi Doreen Crilly (Wight) here. I can give you two names for this photograph. The first 2nd row first left my brother William Wight and the second is 3rd row first left Robert Stevenson. We lived in Burns Avenue, including Robert. Hope this helps. I now live in Ellesmere Port near Liverpool/Chester and my brother Billy lives in Dumbarton and has just retired from teaching. 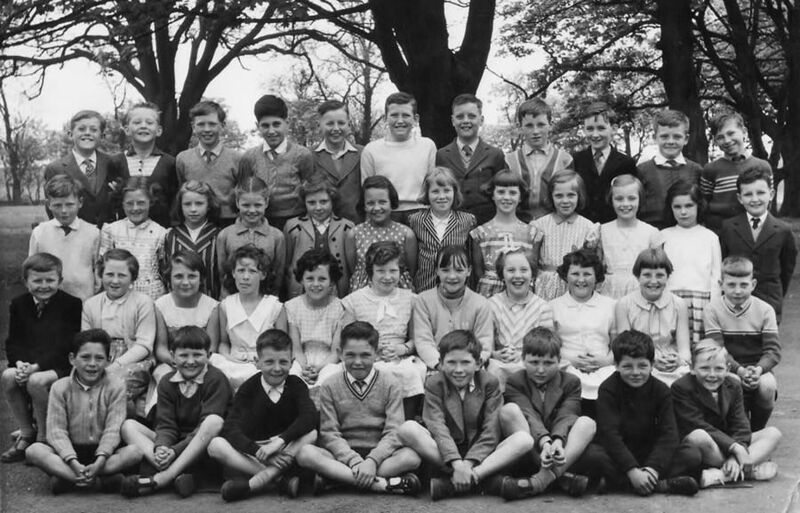 Hi my names is Ian Irvine Mchallam I am the last one on right 3rd row on bottom row is Alex Barr of New England road not William at at other end is Philip Davidson I have this photo but thought it was earlier than 1959 as fire at Pringles was the year I started school1955. I believe my mum is in this photo, Madeleine de mello. Delighted to come across this page. My mum passed away in 1999 but lovely to have come across a couple of pictures of her here. Hi Stevie, a warm welcome to the 3ts. I wonder if Denise de Mello was related to your mum, it’s such an unusual name. When I was at Ardrossan Academy a few millennium ago, Denise was a few years above me - I believe she now lives down in Trumpton (or Turnberry as it used to be known).